M.U.S.C.L.E. prices are quite unpredictable – especially for something like the Quik figures. Your #153 figure will probably bring the most money, the others will be significantly less. If you sent me a picture of the figures, then I could probably be a bit more specific in my feedback. But I would offer one suggestion, start the auctions low (like $1 low). M.U.S.C.L.E. collectors will happily pass on over-priced auctions. If you have something worthwhile, then M.U.S.C.L.E. collectors will find it and pay a fair market value. Well preserved treasure , all found enclosed in this red candy box. Clearly vintage and saved with care for over 25 years from a guy who loved these figures as a kid. His Ma worked at Nestles in Fulton NY ,and she bought a factory case at the company store for him. Each one of these came from inside of a Nestle Nesquik Cocoa Mix Can as a prize. A limited promotional run by Mattel and Nestle that was even advertised in comics. The most befuddling statement in the auction description is, “I think these might be exclusive only to upstate New York where I live.” He knows that is an outright lie, because he attempted to trumpet his auction on the Advertising & Promotion 300 – M.U.S.C.L.E. and Nestle Quik page. While not overtly stated, the campaign was clearly not regional. This auction will not sell for $1,025.25. Most collectors are not interested in owning 25 Nestle Quik figures. Even purchasing the lot in hopes of reselling the lot is a poor decision. While the #153 figure would certainly bring the most money it seems highly unlikely that enough interested parties would enter into bidding wars for the remaining 24 figures at worthwhile price points. This is a great collection of 25 figures, but hopefully this lot is broken up and relisted. It will yield the best results for the seller and M.U.S.C.L.E. collectors. UPDATE: The starting bid has been dropped to $925.75. It doesn’t change anything. Not only does it become immediately apparent it starts to seem like the Purple #153 is painted given the amount of lint and hair sticking to it. This seller, grandpappys-attic, has been mention on this website twice before: (1) the first time for a similarly sketchy sale; and (2) a second time in the epilogue (see the last auction auction) for selling hundreds of keshi figures. This seller is too familiar with M.U.S.C.L.E. and keshi figures to pretend to be that naïve. The second auction is a scam. Do not bid and cancel bids if they have already been placed. The next few auctions, from a well-known seller and member of the message board littlerubberguys.com – lhssenior, are simply stunning. These are the types of auctions that M.U.S.C.L.E. collectors should be dreaming about. The third auction, M.U.S.C.L.E. Men Complete Original Retail 4-Pack Display W/Shipping Box, is beautiful. It is the somewhat overlooked Pre-Pack. The piece is an incredibly interesting part of M.U.S.C.L.E. history and quite attractive too. The art featured on the Pre-Pack is not only visually appealing, but these images are not seen on any other M.U.S.C.L.E. item. The best part of this auction is that it also includes the original shipping box. It is the most uncommon part of the Pre-Pack to be included – certainly very exciting for M.U.S.C.L.E. collectors with a passion for ephemeral pieces of M.U.S.C.L.E. history. The third auction is incredibly difficult to predict. Collectors usually love the piece and appreciate its rarity, but it can be difficult to display. The third auction will sell for $45.50. The fourth auction, M.U.S.C.L.E. Men 10-pack Original Diaply Box with 4 sealed 10-packs MIP, is also from lhssenior. The 10-Pack Display Case is not only beautiful, but it may be the most functional for display. It was designed to sit on a shelf or table top which makes it a very easy piece to display and house additional M.U.S.C.L.E. items inside without looking like a hoarder created the display. It marries functionality and beauty. Best of all, this 10-Pack Display Case comes with four sealed 10-packs. It’s like a giant cherry on top of an already perfect ice cream sundae. Like the third auction, the fourth auction is also very difficult to predict. The four 10-packs could easily add $200 ($50 per 10-pack) in the minds of some collectors, which may automatically tack on $200 to the final price of the 10-Pack Display Case. The final price of the fourth auction will be $124.50. Lhssenior provides another stunning auction for the fifth auction – M.U.S.C.L.E. Men Complete Case of 72 sealed 4-Packs W/Original Shipping Box MOC. Collectors will probably approach this one of two ways. The first, “Wow! 72 sealed 4-packs.” The second, “Wow! The original shipping box for 4-packs.” It is the former that will probably win out when it comes to deciding the final price of the auction. The seller is savvy enough to have scanned through for any Class A figures, so it is very unlikely that a hidden gem is contained within the 72 4-packs. So if a gem isn’t contained, why does anyone need 72 4-packs? The buyer of this auction will probably turnaround and resell a large number of the 4-packs. With that in mind, the final price of the fifth auction will be $851.50. The sixth auction, GIANT lot of over 500 Mattel flesh color M.U.S.C.L.E. Men figures from the 80’s, is just huge. 500 M.U.S.C.L.E. figures deserve attention. Although when lots like this appear there can be a difficult tipping point to identify. Large lots bring in more bids and higher prices, but lots can actually get too big and scare of bidders not wanting to spend several hundred dollars on a lot of M.U.S.C.L.E. figures. For 500 Flesh figures that appear to be in good condition this lot seems to be safe from being too big – but just barely. The final price of the sixth auction will be $365. The seventh auction (yep, it’s a really great week to be a M.U.S.C.L.E. collector), Original Kinnikuman RARE Part 91-3 Satan Cross Figure M.U.S.C.L.E. Men Muscle, again comes from lhssenior but this time it’s a Kinnikuman figure – and quite a rare one. The University of M.U.S.C.L.E. 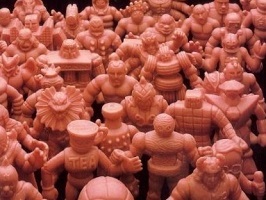 is not as knowledgeable on the prices of original Kinnikuman keshi figures. However this is a well-known, popular character that is also known to be on the “rarer” side. This will probably end higher than most casual collectors would expect. The last auction, MUSCLE men figures, serves as a perfect bookend for Auction Watch #128. The first auction features 24 wonderful Nestle Quik figures. However the seller has overpriced the opening bid – afraid to miss out on capturing the most money possible. As stated in the email to the seller, M.U.S.C.L.E. collectors will find the good stuff. This last auction is a perfect example. On the surface the auction appears to be pretty pedestrian. 270+ figures and not the sexiest auction title ever. It could be just a nice lot of 270 figures, but it can be guaranteed that collectors quickly identified the Satan Cross and are ready to spend a little bit more on this already nice lot of figures. Sellers don’t need to highlight their auctions. They don’t need to provide backstories. Just simply put M.U.S.C.L.E. items up with low opening bids and good pictures and the M.U.S.C.L.E. collectors will do all the work and pay a fair price. This entry was posted on Thursday, April 4th, 2013 and is filed under Advertising & Promotion, Art, Auction Watch. You can follow any responses to this entry through RSS 2.0. You can skip to the end and leave a response. Pinging is currently not allowed. Just in case anybody feels that I am being overly harsh on the first auction, here is a sealed Nestle Quik figure that ended yesterday for $26 – plus 12 figures and a trash can. The estimations are meant to be a fun and interesting part of Auction Watch. You can read a little bit longer conversation about this topic here. You hurt sellers. Do they hurt you? You tell bidders to cancel bids and bash sellers listings. Defamer of goodness. The only auction I suggested bidders should cancel their bids was the FAKE Purple #153 auction. I would always attempt to make people aware of situations like that. Hell, I did it to one of my good friends as part of last week’s Epilogue – Seventh from the bottom. That is my good friend Johnny. I believe absolute transparency and honest is always best. So what if people put crazy prices on things. If nobody buys them, then who cares. If someone does buy something at a high price with which you simply don’t agree with, why do you care? However, in the spirit of transparency and honesty, let’s consider my task – attempting to write a new and hopefully interesting Auction Watch each week about M.U.S.C.L.E. and M.U.S.C.L.E.-centric auctions. If I simply posted auctions, without any type of commentary and perspective, do you think it would get boring? Maybe redundant? While I save my personal commentary for the Epilogues, my goal with the Auction Watch perspective is to make the very best effort to encapsulate past auctions, collectors’ behaviors, and my M.U.S.C.L.E. collecting experience in a logical voice. Objective would be great – but it would be too boring. Logical allows an “objective tone” but still allows for the pointing out of silly auctions, overpriced auctions, and/or frauds. I wish. I wish people would blindly follow me. It would be so awesome and the M.U.S.C.L.E. community would be bigger, better, and stronger. But I will own the title of guru. I’ve spent a ton of time researching and documenting M.U.S.C.L.E. toys. I started liking it even more than owning any of the toys. I know a ton about M.U.S.C.L.E. and I am an expert. I’m also self-aware enough to know that I am a big fish in a puddle on the side of the road – not even a small pond. I am an expert in possibly the least useful information ever, but it was fun and interesting and I’ve worked pretty hard to share it all. Damn it. I spent all this time responding and the guy turns out to be a nut. Mr. Tad Cherry, we have nothing going on. I am the one who ended up with the case of 72 carded 4 packs. Just got it in the mail yesterday. As predicted here, no real gems, but still a cool thing to own. And I was certainly pleased with the final price of around $540. Auction Watch #130 - Interesting M.U.S.C.L.E. Auctions | University of M.U.S.C.L.E. Auction Watch #134 - Interesting M.U.S.C.L.E. Auctions | University of M.U.S.C.L.E.